Angela Brigid Lansbury, CBE (born 16 October 1925) is an English actress and singer whose career has spanned seven decades. Her first film appearance was in Gaslight (1944), for which she received an Academy Award nomination as a malevolent maid, and she expanded her repertoire to Broadway and television in the 1950s. Respected for her versatility, Lansbury has won five Tony Awards, six Golden Globes, and has been nominated for numerous other industry awards, including eighteen Emmy Awards. Some of her films include The Manchurian Candidate (1962), Bedknobs and Broomsticks (1971) and Beauty and the Beast (1991) and she was successful in such Broadway productions as Blithe Spirit, Gypsy, Mame, and Sweeney Todd. Lansbury is more recently known for her role as mystery writer Jessica Fletcher on the U.S. television series Murder, She Wrote, in which she starred from 1984 to 1996. Lansbury was born in Poplar, London , England , to Belfast -born actress Moyna MacGill and Edgar Lansbury, a politician and prominent businessman. Her paternal grandfather was the controversial Labour Party leader George Lansbury. She is the older sister of producer Edgar Lansbury and a cousin of the late English animator and puppeteer Oliver Postgate (another grandchild of George Lansbury). Her cousin, the academic Coral Lansbury, was the mother of former Australian federal Opposition Leader Malcolm Turnbull. Her earliest theatrical influences were the teenage coloratura Deanna Durbin, screen star Irene Dunne, and Lansbury's mother, who encouraged her daughter's ambition by taking her to plays at the Old Vic and removing her from South Hampstead High School for Girls in order to enroll her in the Ritman School of Dancing and later the Webber Douglas School of Singing and Dramatic Art. Following her father's death from stomach cancer, her mother became involved with a Scotsman named Leckie Forbes, and the two merged their families under one roof in Hampstead . A former colonel with the British Army in India , Forbes proved to be a jealous and suspicious tyrant who ruled the household with an iron hand. Just prior to the German bombing campaign of London , Lansbury's mother was presented with the opportunity to take her children to North America, and under cover of dark of night they fled from their unhappy home and sailed for Montreal ; from there they headed to New York City . When her mother settled in Hollywood following a fund-raising Canadian tour of a Noel Coward play, Lansbury (and later her brothers) joined her there. Lansbury worked at the Bullocks Wilshire department store in Los Angeles . At one of the frequent parties her mother hosted for British émigré performers in their Laurel Canyon home, she met would-be actor Michael Dyne, who arranged for her to meet Mel Ballerino, the casting director for the upcoming film adaptation of Oscar Wilde's novel The Picture of Dorian Gray. Ballerino was casting Gaslight with Ingrid Bergman and Charles Boyer, as well, and he offered her the role of the impertinent and slightly malevolent maid, Nancy. She was nominated for an Academy Award for her 1944 film debut and the following year garnered another nomination for her portrayal of Sibyl Vane in The Picture of Dorian Gray. On Broadway , Lansbury received good reviews from her first musical outing, the short-lived 1964 Stephen Sondheim musical Anyone Can Whistle, which co-starred Lee Remick. In 1966, she was offered the title role in what would become the enormously successful Mame, Jerry Herman's musical adaptation of the novel and subsequent film Auntie Mame, which had starred Rosalind Russell. Mame opened at the Winter Garden Theater in May 1966 and Lansbury received the Tony Award for Best Leading Actress in a Musical. Additionally, Lansbury's recording of the play's song "We Need a Little Christmas" has become widely popular, and receives substantial airplay around Christmastime every year. Lansbury won additional Tony Awards for Dear World (1969), the first Broadway revival of Gypsy (1974), and her English music hall turn as Mrs. Lovett in Sweeney Todd (1979). Signing autographs for fans after performing in Blithe Spirit, 2009. In 1971, Lansbury was cast in the title role in the musical Prettybelle. After a difficult rehearsal period, the show opened to brutal reviews in Boston, where it closed within a week. In 1982, a recording of the show was released by Varese Sarabande which included most of the original cast, and Lansbury's 11 o'clock number "When I'm Drunk, I'm Beautiful" along with "You Never Looked Better", a song removed early in the run. She had been announced for the lead role in the Kander-Ebb musical The Visit, to open on Broadway in 2001, but withdrew from the show before it opened because of her husband's declining health. Lansbury returned to Broadway for the first time in twenty-three years in Deuce, a play by Terrence McNally, co-starring Marian Seldes. The play opened at the Music Box Theatre in May 2007 in a limited run of eighteen weeks. Lansbury received a Tony Award nomination in the category of Best Leading Actress in a Play for her role in this production. In October 2008, she was cast as Madame Arcati in the revival of Blithe Spirit, which opened at the Shubert Theatre in March 2009. The New York Times praised her performance, for which she won numerous awards, including the Tony Award for Best Featured Actress in a Play (her fifth win). Lansbury will star as Madame Armfeldt in the first Broadway revival of A Little Night Music, which is scheduled to open in December 2009. Lansbury has enjoyed a long and varied career, often in roles older than her actual age, appearing in such films as Samson and Delilah (1949) and Disney's Bedknobs and Broomsticks (1971). She appeared on the NBC drama The Eleventh Hour as Alvera Dunlear in the 1963 episode "Something Crazy's Going on in the Back Room" and had a prominent supporting role in the film The Manchurian Candidate (1962) in which she portrayed the invidious Mrs. Iselin. She received acclaim for her performance as Mrs. Iselin and received several industry awards. (Lucille Ball had been considered for the role; a decade later, Ball coincidentally landed the title role in the film version of Mame, the role Lansbury had created on Broadway.) On CNN's Larry King Live, Lansbury said that her character in The Manchurian Candidate was her favorite of her many film roles. Lansbury also starred in several dramas before and during her Broadway success, including The World of Henry Orient (1964) and Something for Everyone (1970). Lansbury's popularity from and association with Mame on Broadway in the 1960s had her very much in demand everywhere in the media. Ever the humanitarian, she used her fame as an opportunity to benefit others wherever possible. For example, when appearing as a mystery guest on the popular Sunday night CBS-TV show What's My Line?, she made an impassioned plea for viewers to contribute to the 1966 Muscular Dystrophy Association fundraising drive, chaired by Jerry Lewis. After many years performing on Broadway and in the West End, Lansbury returned to film in Death on the Nile (1978), and portrayed Agatha Christie's Miss Marple in The Mirror Crack'd (1980). She began doing character voice work shortly thereafter in animated films such as The Last Unicorn (1982) and Anastasia (1997); her most famous voice work is the singing teapot Mrs. Potts in the Disney film Beauty and the Beast (1991), in which she performed the title song. She reprised the role for its midquel and the video game Kingdom Hearts II (2006). Lansbury made her first theatrical film appearance since The Company of Wolves (1984) as great aunt Adelaide in Emma Thompson's Nanny McPhee in 2005. 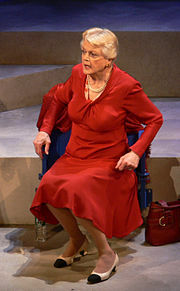 Lansbury has won every Tony Award for which she has been nominated except the nomination for Deuce in 2007, but has not been the recipient of an Academy Award or an Emmy Award. She has been thrice nominated for the Academy Award for Best Supporting Actress; she reflected on these losses in 2007 and stated that she was at first "terribly disappointed, but subsequently very glad that [she] did not win" because she believes that she would have otherwise had a less successful career. Lansbury has received eighteen Emmy Award nominations, and holds the record for the most losses by a performer, twelve of which as Outstanding Lead Actress in a Drama Series. However, she has received several other prominent awards, including the Golden Globe, and is tied with Jack Nicholson and Meryl Streep for most Golden Globe Award wins with six each. In 1983, Lansbury starred opposite Laurence Olivier in a BBC adaptation of the Broadway play A Talent for Murder, which she described as "a rushed job" in which she solely participated to work with Olivier. Subsequent to this performance, Lansbury continued to work in the mystery genre, and achieved fame greater than at any other time in her career as mystery novelist Jessica Fletcher on the U.S. television series Murder, She Wrote (1984—1996). It became one of the longest-running detective drama series in television history and made her one of the highest paid actresses in the world. She assumed ownership of the series in 1991 and acted as executive producer from that season onward. In 1994, Queen Elizabeth II of the United Kingdom appointed her a Commander of the Order of the British Empire. Lansbury was named a Disney Legend in 1995. She received a Screen Actors Guild Lifetime Achievement Award in 1997, Kennedy Center Honors in 2000, and has a star on the Hollywood Walk of Fame . The New Dramatists Lifetime Achievement Award on May 16, 2000. The Acting Company's First Lifetime Achievement Award on November 11, 2002. The Actor's Fund of America Lifetime Achievement on October 30, 2004. The degree Doctor of Humane Letters honoris causa from the University of Miami on May 9, 2008. She was also the guest speaker at the commencement ceremony. George and Ira Gershwin Award for Lifetime Musical Achievement, UCLA Spring Sing. 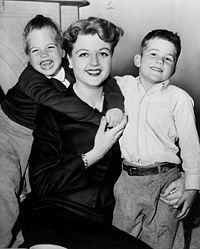 Lansbury with her children in 1957. In 1945, Lansbury married American actor Richard Cromwell when he was 35 and she was 19. Unbeknownst to her, Cromwell was bisexual, and the marriage dissolved after a year, but the two remained friends. In 1949, Lansbury married British -born actor and businessman Peter Shaw, who was a former boyfriend of Joan Crawford. Shaw was instrumental in guiding and managing Lansbury's career. Until his death in January 2003, they enjoyed one of the longest show-business marriages on record. Lansbury is the mother of two, stepmother of one, and a grandmother several times over. In an interview with Barbara Walters, Lansbury revealed a firestorm that destroyed the family's Malibu home in September 1970 was a blessing in disguise, as it prompted a move to a rural area of County Cork in Ireland , where her children were separated from the hard drugs with which they had been experimenting. Her daughter had also been briefly involved with the Manson Family. Her son Anthony Shaw, after a brief fling with acting, became producer/director of Murder, She Wrote and presently is a television executive and director. Her only daughter Deirdre and son-in-law, a chef, are restaurateurs in West Los Angeles. Lansbury was related to Peter Ustinov by her half-sister Isolde's marriage to the British actor (they divorced in 1946). The two former in-laws appeared together professionally once in Death on the Nile (1978). Lansbury is related by marriage to actress Ally Sheedy, wife of her nephew David Lansbury. Both her brothers, twins Bruce and Edgar, are successful theater producers: Edgar Lansbury, Jr. was instrumental in bringing Godspell to Broadway and Bruce Lansbury was a television producer for such shows as The Wild Wild West and Mission: Impossible. She had knee replacement surgery on 14 July 2005. Lansbury is also a vegetarian and a longtime animals rights activist. Lansbury was a long-time resident of Brentwood, California , and supported various philanthropic groups in Southern California. In 2006, Lansbury moved to New York City, purchasing a condominium at a reported cost of $2 million. The following year, she returned to Broadway in Deuce. Lansbury's papers are currently housed at the Howard Gotlieb Archival Research Center at Boston University . 1999 Fantasia 2000 Herself - Hostess segment "Firebird Suite - 1919 Version"
London Gazette: no. 53696, page 26. Accessed 3 May 2009. Windeler, Robert.New York Times, "Angela Lansbury a Hit in Coast 'Mame'", 29 June 1968, p. 19 "She played it [Mame]...in SanFrancisco for seven weeks... The show is here also for a seven- week run...In September, Miss Lansbury will be involved with 'Dear World' "